﻿ The Order of Constitution Defenders | "Defending the Republic through the pursuit of Truth"
OUR STANDARD OF LAW AS IT IS WRITTEN, IS A REPUBLIC UNDER GOD. NOT UNDER GOVERNMENT AS STATUTES, CODES, RULES OR REGULATIONS, Spike! Globalism and the push for it is a real action initiated to create one world Government. The question is what is the real purpose of the Muslim infiltration and the full illegal imigration initiated by national and world elites? All information on this website is ll information on this website is proprietary and is not to be copied without the written permission of Spike, Eric A. Kiesche. Disclaimer: All content on this site is for informational, educational, and political purposes. 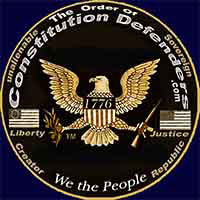 It is to promote truth, freedom, The Constitution, Declaration of Independence and the Republic for which it stands. It is in no way to be misconstrued or interpreted as legal advice or counsel, and does not necessarily represent all of the views of its vendors or advertising organizations.All Rights Reserved, trademark, 2007-2050: Constitution Defender All infomation on this site is the intellectual property of Spike, Eric A. Kiesche Founder of The Order of Constitution Defenders/ Defender Brotherhood.